Is BillionLotto.co.ug a Scam or Legit? Read 2 Reviews! BillionLotto.co.ug Exposed — Who Wants To Be a Billionaire? Looking at lotteries internationally, how much does the amount of the jackpot get you to jump on the bandwagon. We were looking at Uganda’s Billion Lotto game this last week and one of the things that was weird is that there was nowhere on their home page that said what the actual jackpot is. Part of that makes sense as the jackpot is a percentage of the prize pool which is generated from ticket sales but you’d think they’d get a fix on a guesstimate. Let’s look deeper. Billion Lotto is a lottery game played twice a week (Wednesday & Saturday) where players choose six numbers between 1 and 49. There isn’t any bonus ball. Ticket lines cost UGX 1,000 (that’s Ugandan shillings) which is about the equivalent of around 27 cents US. Players can play 1 to 924 tickets for each draw. Multiple draws are available up to 10. Oh – and you can play through your mobile telephone. There are four prize tiers and all tiers that do not win roll over into the jackpot for the next draw. The most important thing to be aware is that you have ninety (90) days to claim your winnings. If you’ve bought your winning ticket through ‘mobile money’ then payment will be made straight into your phone. Tickets purchased through retail stores up to UGX 200,000 can be claimed there. Anything over, UGX 750,000, contact their National Lottery office. The jackpot starts at 1 billion Ugandan Shillings, the equivalent of around USD 273,000. Okay, compared to some of the international mega jackpots this is not a lot, but for Ugandans, we’re talking serious money. Though many sites say there is tax taken, BillionLotto.co.ug says there is none. Who Can Play at BillionLotto? Who can play might be the billion dollar question. There is no information on their site on who can play and more importantly for the internationals, who can’t play. We finally heard back from the Customer Service and this game can only be played in Uganda. They do say that to claim your winnings, you need to produce either your national ID card or passport. That sorta suggests that anyone can play, but you need to actually be in the country. Though the terms and conditions plus FAQ does answer a lot of questions, you still might want some info. 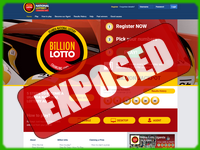 BillionLotto.co.ug offers an internal toll free number, email and snail mail address for customer service. They are open Monday to Sunday 8:00 am to 9:00 pm. Nice to see they don’t take a day off from answering questions. This is an official lottery run by the Ugandan government. Currently, Uganda’s Billion Lotto supports the “Bless a Child Foundation” though there isn’t any specific information on the ratio of how much of the ticket sales goes to them. Bless a Child Foundation supports children with cancer with better treatment services. Nice idea thought it would have more credibility if they published the amount or percentage that went to the kids. There is a lovely picture on their site of a Ten Million Shillings check that was presented to them from Billion Lotto in December 2015. I guess every little bit does make a difference! This definitely isn’t one of those mega lotteries like US Powerball or EuroMillions that is going to draw the attention of the world. At the same time for Ugandans, it would be a life changing win to hit the jackpot. I do like it’s a 1 to 49 draw game without a bonus ball. This means pretty good odds compared to some of the other games around the world. This looks like it is a cute little lottery that probably gets a lot of attention in Uganda but not around the rest of the world. It could get up there in a solid winning jackpot though it would be nice to know how much that actually is. As of May 12th 2017, BillionLotto is no longer available and no draw has been conducted since! They claim it’s a “System Upgrade” but what upgrade lasts a month. My experience, SCAM!!! Stay away. Hey, this jackpot might not look like a billion dollars, but it still could make a huge difference for someone in Uganda. It has a good format of only 49 balls and no bonus ball which increases the probability odds. And it is an official lottery. The only thing is you definitely have to be there to play and win.